We purchased a Nikon D750 camera several months ago and this is the first trip we have actually put it to use. We are slowly getting the hang of it but photography is tough and it will take us some time to get it figured out. That being said, as many bells and whistles as it has, pictures are still nothing compared to what the human eye can see. 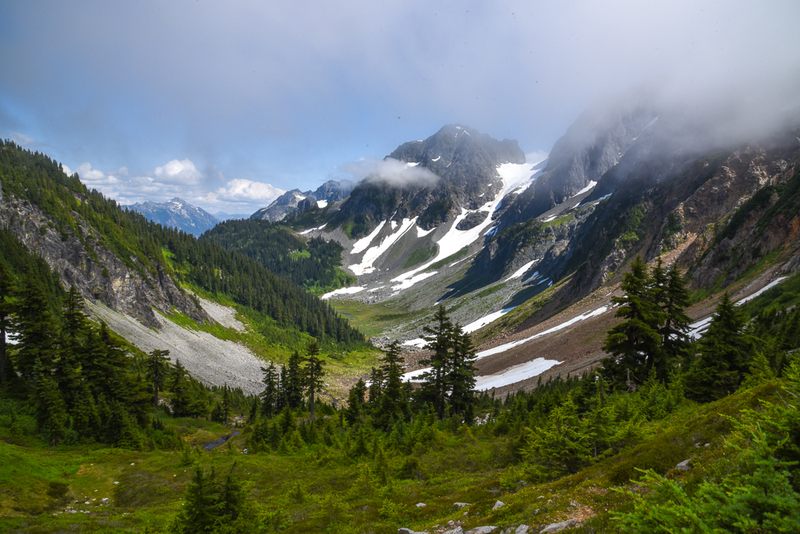 Cascade Pass was a 8 mile hike through wildflowers, showcasing a wall of waterfalls and glaciers. I can’t remember how many times I said, “Wow! Just Wow!” If pictures say 1,000 words, they can write this blog today. But, there were a few additional highlights of the hike, as if the scenery wasn’t enough. We stopped for awhile at a rock slide area where marmots shrieked to each other and scurried around munching on the green and floral vegetation. We saw a few mouse-like pika playing as well. 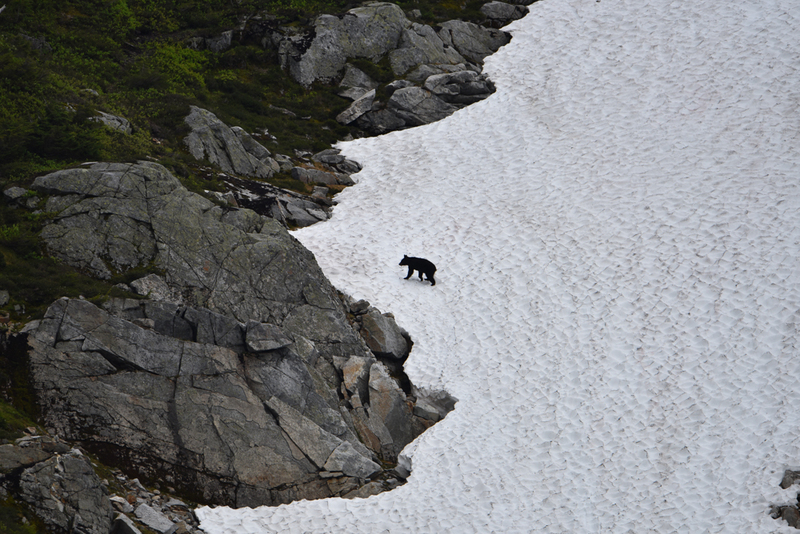 We were on our way back down from the pass when a family was stopped and looking at something. 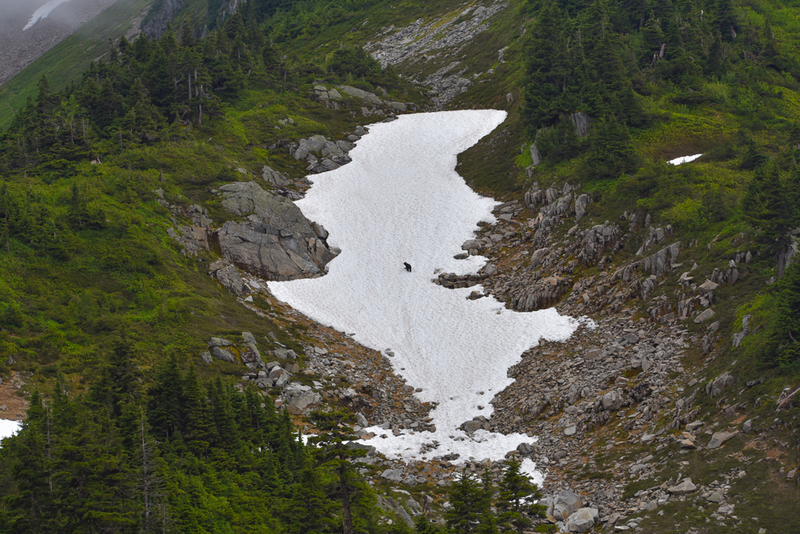 I asked if they were watching the marmots and they said, “oh yeah, and that bear down there.” Icing on the cake. Unfortunately we didn’t have a tripod with us so the bear pictures were not great due to the distance but we took a bunch anyway. Sometimes you need pictures to remind you of your adventure regardless of the quality. We had passed some berry plants that looked somewhat like raspberries but different. Kinda like salmon eggs, translucent but colored orange or bright red. 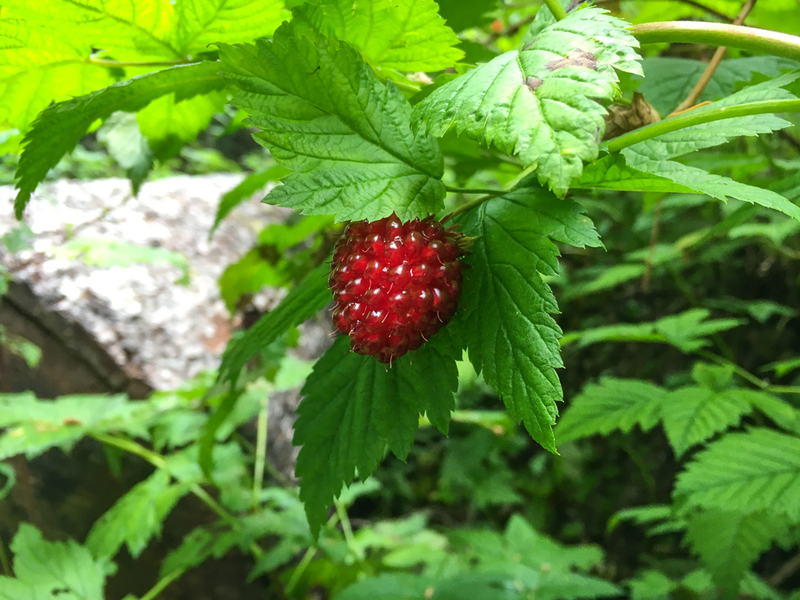 I questioned a few hikers and confirmed that they were salmonberries, and edible. I tried two (you can’t just try one in case you just happened to get a nasty one). They almost taste flavorless (Mark would have called them gross if he had actually tried one.) It is like biting into a juicy blast of slightly bitter flavorlessness with small seeds. 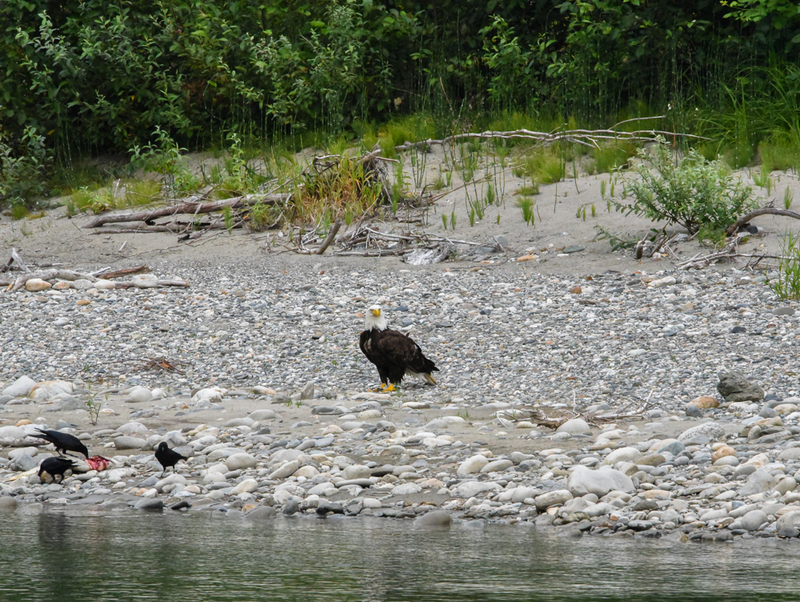 On the way back to camp we noticed a bald eagle on the shore of the river eating a salmon. We pulled over and grabbed our camera and tripod and ran across the road to get setup to take some pictures. Of course, just as we get everything setup some other tourists noticed and pulled over in front of us and scared the eagle away. Grrr! Anyway, we waited for awhile and it came back. However, some small black birds had started eating the fish and we thought for sure the eagle would swoop in and scatter them. It didn’t, it just sat there and watched them. What’s up big bad eagle?? The pictures look great, even if you are still learning how to use your new camera. Wow! You really got to see some great wildlife, and the berries do look good! That’s a great photo of that bear! Why don’t you “get it all” in one day??? What a trip! Are you ever coming home?